This script allows users to customize their own windowskins using the windowskins included in the windowskins folder. They can use parts of the existing windowskins to customize their own windowskin. Also allows them to change some font settings such as bold, italic, size, and normal_color, system_color, critical_color, etc. And once they are done creating their windowskins, they can save them. Allow users to create custom windowskins. Allow users to recolor their windowskins. Choose whether or not to use the RTP windowskins. Allow users to save their windowskins. Allow users to customize font properties. # - This window displays the main choices. # - This window displays recolor options such as hue and saturation. # - This window displays options for changing font options. # - This window displays options for changing default font options. # - This window displays options for choosing colors. # - This window displays options for loading configurations. s = [''] if s.empty? # - This dims the windows in the background. # - This window displays a preview of new windowskin options. # - This window displays the current chosen options while customizing fonts. # - This window displays a preview of new font options. 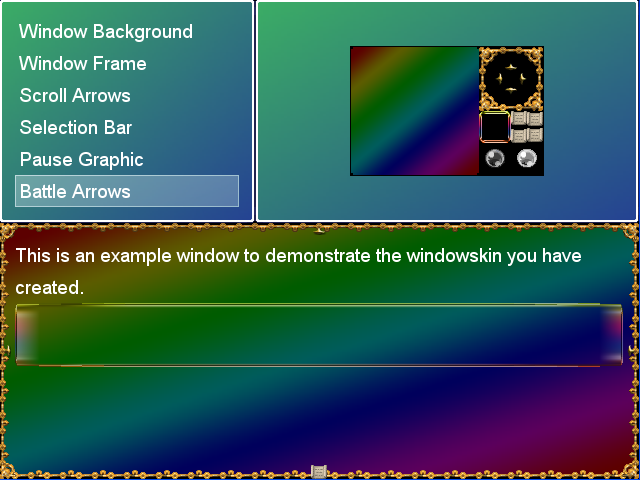 # - This window displays a preview of what the new windowskin would look like. # - This window allows the user to choose a name for their config. # Test if key was triggered once. # Test if key is being pressed. # Test if key is being pressed for repeating. # Test if key was released. # (formerly called keyboard layout handles). # identifier (formerly called keyboard layout handles). rect.width += 1 unless ln.index(/[vVAwf\/\\]\z/).nil? y -= height unless lns.last.nil? name += ".png" if name.index(/.png\Z/).nil? Just put the windowskins you want users to be able to customize from in the windowskins folder. Press F7 to bring up the windowskin customization menu. Also, you'll need this dll for the script to work. Yeah, do you know if it's possible to read the game.ini file to find what dll to use? Give credits to ForeverZer0, it's from his script. It reads the library from the ini, then creates the functions for receiving the RTPs. I've been meaning to update this but I could never find the time. And at last, here's version 1.0. Users now have many options when they open the windowskin creator. They can mix-and-match parts of windowskins to create their own, recolor windowskin parts or the entire windowskin, customize font properties, or save or load any previous configuration. I also fixed a massive bug in the script that would cause errors upon saving the game.